Ensuring all high school students have not only mastered reading basics but also have the skills to understand complex text has always been a challenge in Chicago Public Schools. Under Paul Vallas, the threat of being put on academic probation forced high schools to add formal reading instruction to their curriculum. Central Office created its own team of reading experts to help high schools make the shift. But by the mid-2000s, schools were still struggling. High school teachers didn’t have training to teach reading, and classes paid too little attention to the teaching students how to read and understand nonfiction text. Many students were never taught how to read at a higher level. In 2005, more than 75 percent of CPS graduates who entered City Colleges failed to place into college-level English classes, instead landing in remedial reading and writing courses. See “High schools get reading Rx,” May 2000 and “College dreams get reality check,” September 2005. In recent years, CPS has become a laboratory for research into better ways to help middle and high school students read more deeply and critically. In 2010, the district joined Project READI, a federal research project studying best practices for adolescent higher-level skills such as formulating an argument based on evidence from a text and “disciplinary literacy,” or subject-specific approaches to reading. Teachers learned new techniques and helped develop curriculum to teach students to read literature, history and science. But only 28 schools took part, and three of them were among the elementary schools closed in 2013. Project READI did not address the continued problem of helping new high school students whose reading skills were far below grade level. In 2013, more than one-quarter of freshmen were more than two years below grade level in reading, according to results on the EXPLORE test. 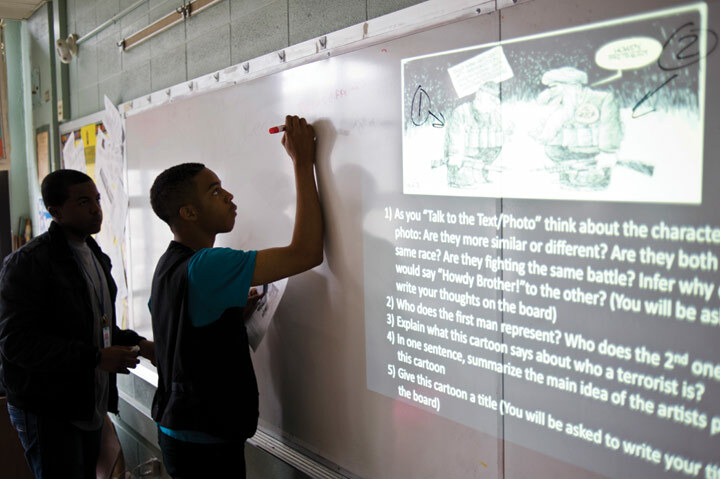 Previously, efforts to improve reading by putting low-scoring students into double-period English classes as freshman proved ineffective, according to a study from the University of Chicago Consortium on School Research. See “Reading Woes,” and “Boosting Basic Literacy,” June 2013. Though Project READI has run its course, other initiatives are trying to make headway with the problem. A new federally-funded effort, Reading Apprenticeship Across the Disciplines, is supporting teacher training for schools in Network 11 and schools that partner with the Network for College Success. Over the last five years, the Network for College Success has trained more than 375 teachers in Reading Apprenticeship, a particular approach to disciplinary literacy developed by the research organization WestEd. Beyond the federally-funded effort, the group expects to train an additional 90-100 high school teachers in Reading Apprenticeship. Instead of having teachers rely on having students use strategies like graphic organizers or Cornell notes, Reading Apprenticeship encourages them to model for students by reading a science or history text aloud and explaining their thought process as they go along. Students also annotate texts to deepen their understanding. CPS has new science standards, but schools need the basics: training for teachers, engaging curricula and ideally, dedicated science labs. Meanwhile, the district has until May 27 to give this year’s science test–which CPS skipped last year.